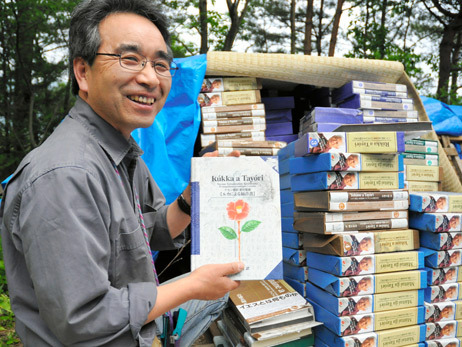 "Tsunami Bibles" help Japan to understand the tragedy 3 thousand copies of the Bible translated in the local dialect which survived the tidal wave that enveloped the country on March 11,are back on sale. They give an answer to those who suffered and will help the publishing house back on its feet. 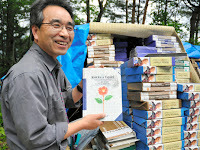 Photo shows stacks of the Kesen-dialect Bibles that survived the tsunami. When the publisher was ready to sell the slightly damaged books at a discount, Masahiro Kudo, deputy director of the Miura Ayako Literature Museum Foundation advised him not to hesitate selling them at full price, saying "They are very precious copies. They demonstrate the love of God for the survivors." Sales will help the publisher rebuild his devastated business.